Congratulations to the IMG Everest 2002 Expedition team, led by Eric Simonson. They were successful in putting five climbers and five sherpas on the summit. Reaching the top were Phil and Sue Ershler, Ted Wheeler, Stuart Smith, Jake Norton and Sherpas Danuru, Dorje Lama, Mingma Tschering, Mingma Ongel, and Karma Rita. Phil and Susan Ershler on the summit of Mt. Everest, May 2002. 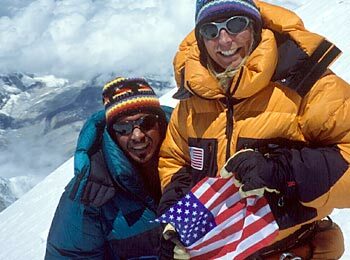 Phil and Sue become the first couple to do the Seven Summits and Phil became the first person to do them twice! GET THE BOOK: "Together on Top of the World"
Phil and Susan Ershler's powerful, inspirational adventure story of the first couple to climb the Seven Summits.